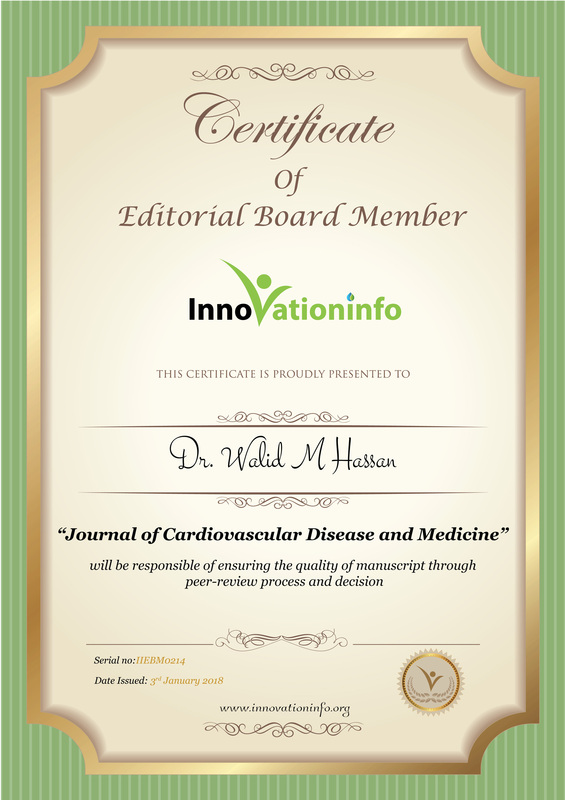 Designation: Director, Cardiovascular Center of Excellence International Medical Center, Saudi Arabia. Research Interest: Percutaneous Coronary/Vascular/Valvular and Structural Intervention. Percutaneous Aortic and Pulmonary Valve Implantation (TAVI/TPVI) / Aortic Aneurysm Endovascular Repair (EVAR)/ Renal Denervation/ EndoVenous Laser Ablation (EVLT), Diabetic Heart Disease. Biography: Dr. Walid M Hassan is a Director, Cardiovascular Center of Excellence, International Medical Center, Jeddah, Saudi Arabia. He is a Cardiovascular Disease (cardiology) Specialist in Webster, Texas. He worked as a Former Head of Adult Cardiology (August 2000- June 2010), Former Director of Interventional Cardiology, King Faisal Specialist Hospital and Research Centre, Riyadh, Saudi Arabia, Director of Cardiac Critical Care, University of Missouri-Columbia (July 1996-July 2000), American College of Chest Physicians (ACCP) Governor, Council of International Regents and Governors, Former Director, Cardiac Catheterization and Intervention, Former Director, Cardiac Intensive care University of Missouri- Columbia (July 1, 1996- August 15, 2000), Fellow American Heart Association, Fellow American College of Cardiology, Fellow American College of Chest Physicians, Fellow American College of Physicians, Fellow The Society for Cardiac Angiography and Interventions (Executive Committee), Founder and Chairman of ACS Academy- KSA, Membership of 50 International Scientific Societies and Associations.he is a Editorial Board and Reviewer for 45 International Journals, 625 Published Articles/ Abstracts/ Presentations. 5- American Board of Endovascular Intervention.